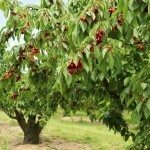 Emperor Francis sweet cherry trees are suitable for growing in USDA plant hardiness zones 5 through 7. Plant at least two or three trees nearby for pollination, including one variety that flowers about the same time. Plant Emperor Francis cherry trees in late fall or early spring. These cherry trees need at least six hours of sunlight per day, preferably more. The trees won’t bloom without adequate sunlight. Plant Emperor Francis cherry trees in a location where the soil drains well. Avoid areas that are prone to flooding or where the water doesn’t drain well after a rainfall. Provide Emperor Francis sweet cherries with about 1 inch (2.5 cm.) of water per week when the trees are young, or a little more when during hot, dry periods, but don’t overwater. As a general rule, you should water whenever the soil feels slightly dry. Surround the tree with 3 inches (8 cm.) of mulch to prevent moisture evaporation. Mulch will also keep weeds in check and prevent temperature fluctuations that can cause fruit to split. Fertilize Emperor Francis cherry trees every spring, about a month before flowering, until the trees begin to bear fruit. Use a light application of a low-nitrogen fertilizer. Once the trees begin to bear fruit, fertilize annually after the completion of harvest. Prune the cherry trees in late winter. Remove dead or damaged growth and branches that cross or rub other branches. Thin the middle of the tree to improve air circulation and prevent mold and mildew. Remove suckers from the base of the tree by pulling them straight up and out of the ground. Otherwise, like weeds, suckers rob the tree of moisture and nutrients.